Americans have mixed views of how careers in science, technology, engineering and math compare to jobs in other industries. About half or more of the general public – whether they are employed in STEM or non-STEM jobs – believe that STEM jobs pay better, attract more of the brightest young people and are more well-respected. But roughly half of Americans say these jobs are difficult to get into, while only 18% believe careers in STEM have more flexibility for balancing work and family than jobs in other industries. That flexibility is an important factor in choosing a job for both men and women in STEM, as well as those working in other areas. For the most part, men and women in STEM look for similar job qualities; one notable exception is that 59% of women tend to value jobs that help others, compared with 31% of men. 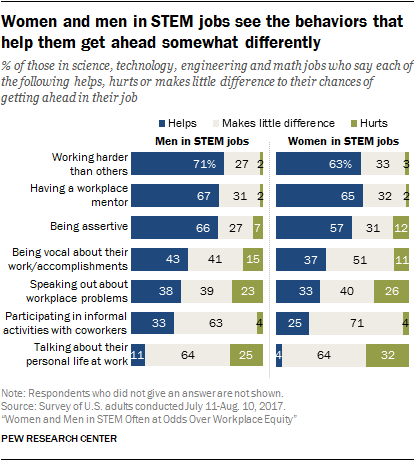 Interviews with people working in STEM fields highlight the sometimes subtle ways that women feel they are treated differently at work.33 The Pew Research Center survey finds overall, men and women in STEM see behaviors that help or hurt them to get ahead in the workplace somewhat differently. Men in STEM jobs see more advantage in working harder than others, being assertive, and being vocal about their accomplishments at work. Among women, those who work in majority-male settings are more likely than other women in STEM occupations to think these behaviors help them get ahead in their job. And, women in majority-male work settings are particularly likely to say they need to prove themselves at least some of the time at work in order to be respected by their coworkers. About seven-in-ten Americans (71%) believe that jobs in STEM have higher salaries than those in other fields. 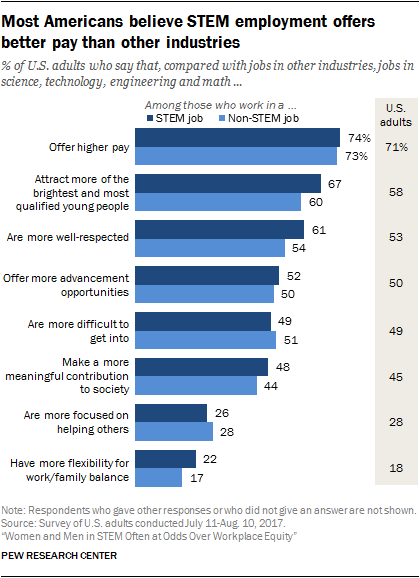 More broadly, though, Americans have mixed views of how careers in STEM stand up against other sectors. Some 58% of U.S. adults say that jobs in STEM attract more of “the brightest and most qualified young people.” And half of Americans (50%) say that careers in STEM “offer more opportunities for advancement,” a similar share (49%) believe that STEM jobs are more difficult to get into. While 45% of respondents say that STEM positions offer an opportunity to “make a more meaningful contribution to society,” 28% say that STEM jobs are “more focused on helping others” than jobs in other industries. And, 18% say that STEM jobs offer more flexibility than non-STEM jobs to balance work and family needs. Some 52% of U.S. adults consider jobs in STEM to have roughly the same amount of flexibility as other jobs and 28% say STEM jobs have less flexibility to balance work and family needs than those in other industries. Perceptions of STEM jobs are generally similar among U.S. adults working in STEM positions and those in other kinds of jobs. And, men and women working in STEM jobs tend to hold similar perceptions of how such positions compare with other industries. Among the differences, men are more inclined than women to see jobs in STEM as having comparatively more flexibility to balance work and family needs (28% vs. 17%). See Appendix for details. About seven-in-ten (68%) employed U.S. adults say that having the flexibility to balance their work and family obligations is an important factor in choosing a job. Indeed, some 38% ranked it as the most important, more than any other characteristic considered in the survey. In all, 53% of employed adults say “having opportunities for promotion or advancement” is important to them, followed by “having a high-paying job” and “being in a workplace that is welcoming for people like me” (46% each). Men (71%) and women (76%) in STEM careers largely agree that being able to balance work and family is important to them in choosing a job. However, their views are somewhat different on other priorities. For instance, 57% of male STEM workers say that having opportunities for promotion is important compared with 46% of female STEM workers. And, while around six-in-ten men (59%) say that having a high-paying job is important, about half (48%) of women say the same. Women in STEM jobs share a priority on job flexibility to meet work and family needs with women employed in other sectors. See Appendix for details. 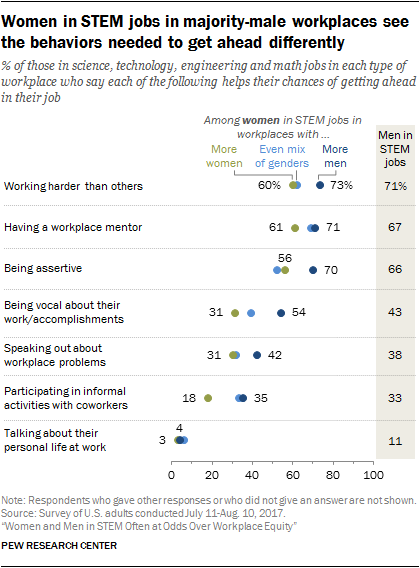 Most people working in STEM jobs say working harder than others (67%), having a workplace mentor (66%) and being assertive (61%) help them get ahead at work. 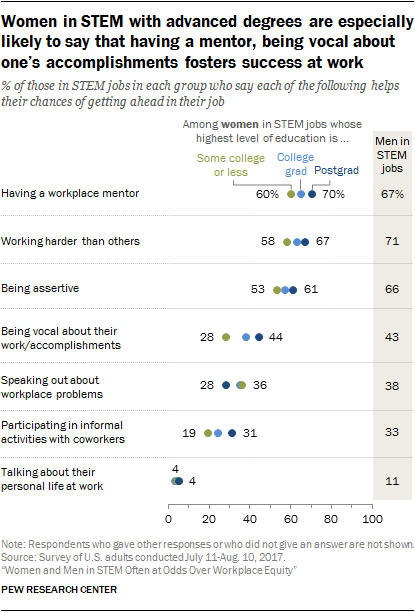 Men who work in STEM jobs are modestly more likely than women in such jobs to see working harder than others (71% vs. 63%), being assertive at work (66% vs. 57%) or being vocal about their accomplishments as something that helps them get ahead (43% vs. 37%). Most STEM workers say participating in social activities outside of work or talking about their personal lives with coworkers makes little difference to their chances of getting ahead. But, men in such jobs are somewhat more inclined than women to think socializing with coworkers helps their prospects (33% vs. 25%). And, about a third (32%) of women in STEM jobs say talking about their personal life at work hurts their efforts to get ahead, compared with one-in-four (25%) men in STEM jobs who say the same. Among those in non-STEM jobs, women and men tend to be in agreement about which behaviors are most likely to improve their chances of advancing in their positions – including the belief that they need to work harder than others (64% vs. 65%) and be assertive (both 59%). For details, see Appendix. There are also differences by race and ethnicity on some of these measures. 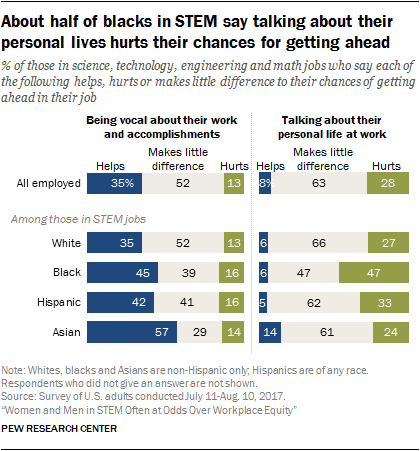 Notably, 47% of blacks employed in STEM say that talking about their personal life at work hurts their chances for advancement; smaller shares of white (27%) and Asian (24%) STEM workers say the same. Asians in STEM jobs are particularly likely to see being vocal about their work and accomplishments as an advantage (57%), compared with white (35%) and Hispanic (42%) STEM workers. A sizeable share of all of these racial and ethnic groups of STEM workers agree that working harder than others and having a workplace mentor generally helps their chances of getting ahead. Some qualitative reports of women and racial/ethnic minorities working in STEM positions have suggested that implicit bias in the workplace can leave such workers feeling less appreciated at work.35 The Pew Research Center survey finds, however, few differences by gender or race/ethnicity in how much workers report feeling valued by their supervisor or their coworkers. Overall, most workers – both STEM and non-STEM – say their contributions are valued by their co-workers and by their supervisor at least some. Men and women in STEM jobs are about equally likely to say this. When asked, “How often, if ever, do you feel the need to prove yourself at work in order to be respected by your coworkers?,” 17% of employed U.S. adults say “all the time,” another one-third (33%) say some of the time and four-in-ten (40%) say either never or not too often. Women and men in STEM jobs are about equally likely to feel the need to prove themselves “all the time” (15% and 16%, respectively) in order to be respected by their coworkers. But, as will be discussed later in this chapter, the sense of having to prove oneself varies among women working in STEM jobs depending on the gender mix where they work. Beliefs about the kinds of behaviors that help employees succeed at work tend to vary among female STEM workers, depending on the gender context where they work. There are some modest differences in beliefs about these issues among women in STEM jobs depending on their level of education as well. The roughly one-in-five women (19%) in STEM jobs who work in majority-male workplaces stand out in how they assess the behaviors needed to get ahead. These women are particularly likely to say that being assertive (70%) helps their chances of getting ahead. Smaller shares of women working with mostly women or in evenly mixed gender settings think this helps their chances of advancement. Similarly, 54% of women in STEM jobs with majority-male workplaces say that being vocal about their work and accomplishments helps their chances of advancing, compared with 31% of women working in majority-female settings. Although, overall, women in STEM jobs are just as likely as men in such jobs to say they feel highly valued by supervisors and coworkers, women working in majority-male environments also say they have to work harder to earn that appreciation compared with women in either majority-female or evenly-mixed gender settings. 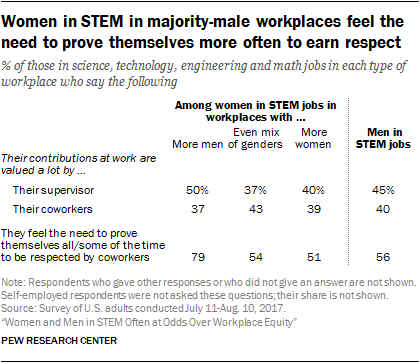 When asked, “How often, if ever, do you feel the need to prove yourself at work in order to be respected by your coworkers?,” 79% of female STEM workers in majority-male workplaces say “all the time” or “some of the time,” compared with 51% of women working in STEM jobs in mostly female workplaces and 54% among those in evenly mixed gender workplaces. There are only modest differences among men in STEM jobs by the gender makeup where they work; overall 56% of male STEM workers say they feel the need to prove themselves at least some of the time to earn the respect of their coworkers. For details, see Appendix. Women in STEM jobs see the behaviors that help them advance somewhat differently depending on their level of education. Those with advanced degrees are more likely than women in STEM with some college or less education to say that having a workplace mentor to advise them helps. And some 44% of women in STEM with a postgraduate degree say that being vocal about their accomplishments at work helps them get ahead; in contrast 28% of women in STEM jobs with some college or less education say the same. While this survey finds that men and women in computer jobs have had different experiences with gender discrimination (as shown in Chapter 3), there are no statistically significant differences between men and women working in computer occupations in their perceptions of behaviors that help or hurt their chances of success or in their sense that they need to prove themselves in order to be respected by their coworkers.